Central Mobility & Rehab Equipment has been serving Central Florida with a full line of home medical equipment, daily living supplies, wheelchair seating systems and mobility products since 2003. How can we serve you today? Central Mobility & Rehab Equipment has a large inventory of lift chairs, mobility scooters, bathroom safety supplies, and many other home medical necessities in our Tavares, Florida showroom so that you can see and test the items before you purchase them. Delivery is available. Learning about and purchasing the right home medical equipment can be confusing. Many of our customers are first time buyers or trying to find equipment for a parent or loved one. Don't worry, Central Mobility & Rehab Equipment can help. Contact us anytime with questions. 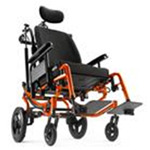 See the Central Mobility & Rehab Equipment online catalog for a more complete list of our products. Contact us or visit our Tavares showroom and we’ll answer your questions.